I’m happy Spring is here, hopefully the weather will cooperate and it will warm up. It also means that we can start thinking about getting outdoors, planting flowers and Spring cleaning! So break out the feather dusters and rubber gloves, but keep these tips in mind to ensure a safe and happy cleaning experience. Get some fresh air. It is very important when using chemical cleaners to keep the room ventilated. 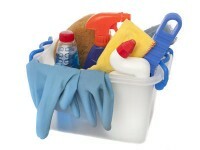 The fumes from cleaning supplies, especially those with fragrances, can be dangerous to the respiratory system and eyes. Some can cause itching and burning in the throat, eyes, and nose. Look for cleaning supplies that only include a few simple ingredients like baking soda, lemon juice, and borax. Check for critters. In the chilly winter months, creepy-crawlies and critters like to hide out in all the little nooks and crannies of our warm homes. Pull freezers and other large object away from walls and check for droppings, chewed wires, or other signs of bugs and rodents. Review fire safety. Check the expiration dates on your fire extinguishers, and replace batteries in fire and carbon monoxide detectors. These small steps can save the life of you and your loved ones! And insurance… Make sure your home or renters policy is up-to-date! This will give you peace of mind and make sure you are protected. PreviousPrevious post:Vestibulum – eget erat non turpis aliquetNextNext post:Are You Thinking of Hanging Up Your Hat and Retiring?